In 2010, college sophomore Elizabeth Minter was diagnosed with gliomatosis cerebri. Before it took her life, Elizabeth and her family worked with neurosurgeon and researcher Dr. Jeffrey Greenfield to launch Elizabeth's Hope. Find out what's going on right now in support of Elizabeth's Hope, and catch up on our past events. Thanks to our loyal supporters, there is almost always a fund-raiser going on somewhere! See what we've done already, and find a current campaign to support. We need your help! Gliomatosis cerebri and other rare pediatric brain tumors don't get much funding from large foundations. That's why we are ''Powered by Families'' — who have the most at stake in this effort. How to make a donation to Elizabeth's Hope. Thanks to our donors, innovative research is now underway that holds promise for unlocking the mysteries of gliomatosis cerebri and other rare and inoperable brain tumors. The diagnosis of an incurable brain tumor is an inconceivable challenge that no child or family should have to face. We at the Weill Cornell Pediatric Brain and Spine Center share your frustration and grief in receiving a diagnosis that has no cure. This impossible situation is the driving force behind the Children’s Brain Tumor Project. In the laboratory, in clinical trials, and in vast data warehouses, we are working hard every day to achieve a single goal: bringing hope to the hundreds of patients and families each year who confront the heartbreaking diagnoses of rare and inoperable pediatric brain tumors. The Children’s Brain Tumor Project was founded in 2011 by the Weill Cornell Pediatric Brain and Spine Center, under the direction of research scientist and neurosurgeon Dr. Jeffrey Greenfield. The project owes its genesis to Elizabeth Minter, whose battle with the rare and inoperable gliomatosis cerebri inspired Dr. Greenfield to undertake his vision for this groundbreaking research initiative. Here at Elizabeth’s Hope we are deeply appreciative of our supporters, and we want to keep all of you updated on the work your gifts make possible. 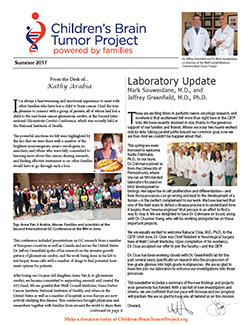 Several times a year we produce a newsletter in conjunction with The Children’s Brain Tumor Project that includes a roundup of what’s going on, including research updates from Dr. Greenfield’s laboratory, event updates and photos, and other news.